Fade to Silence is a wonderful RPG adventure game by Black Forest Games. You will play as Ash, a natural but tormented leader. 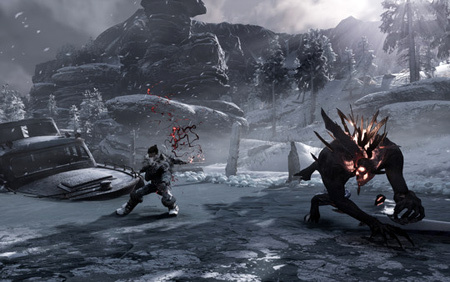 Explore a post-apocalyptic, frozen wasteland to gather the resources necessary. You must navigate a vast territory, in which they will encounter Eldritch monsters and an even greater foe: the unrelenting winter. If caught by surprise, it takes every ounce of skill, determination and luck to survive. The game lets you explore a river delta, a dense forest region and cultivated farmland of an 8km2 area. Pack your sled, take a follower with you and engage in long term expeditions into the farthest regions. If you get stuck in the game, check out the video walkthrough and gameplay for the game. This entry was posted in Android Games, iOS Games, Mobile Games, Walkthrough and tagged Fade to Silence Cheats, Fade to Silence Gameplay, Fade to Silence Guide, Fade to Silence Hints, Fade to Silence Review, Fade to Silence Solutions, Fade to Silence Strategy, Fade to Silence Tips, Fade to Silence Walkthrough by Marvin. Bookmark the permalink.